The material in this web site is strictly intended as an informational source and not as a conversion manual. Seek the expertise of a certified mechanic with extensive experience converting gas vehicles to electric. I don't claim to be an expert in the field, and I expressly deny liability and undertake no responsibility for any injury, loss, theft, damage or expense incurred by persons using this video. Do your conversion at your own risk and only venture to do one yourself only if you know what you are doing and have the appropriate tools. Welcome to the project of converting this Nissan Sentra 2004 to an electric car. This is the page dedicated to the conversion of my Nissan Sentra SE-R Spec-V 2004 to an Electric Car. So, how did I start? One day, several years ago, I was looking for something on youtube, I do not even remember what, when I found a video of a converted electric car. Until that moment, I did not know that it is possible to take any gasoline-powered car, and convert it to electric with parts available in the internet. This happened before the car manufacturers started selling several versions of electric and hybrid vehicles, and my knowledge on the topic was very limited, so I started researching, and I realized that electric cars have been around discretely for over 100 years. Actually, the first electric car was invented in 1834 by Thomas Davenport, and in the late 1890s, electric vehicles outsold gasoline cars ten to one. The first car dealerships sold electric cars exclusively, and many automobile companies like Oldsmobile and Studebaker started as electric vehicle companies. What happened to the electric cars then? They had such a good start. Gasoline was cheap, oil abundant, and the electricity infrastructure was almost non-existent. Motorized assembly lines were created to build cheaper gasoline-powered cars, and since electric cars were limited to in-town driving because of its limited range, and because of the invention of starter motors eliminating the need to crank the engines, the popularity of gasoline-powered cars increased exponentially. The model of using gasoline to power cars, and in general, an oil-based economy worked well for many years, but things are changing. Gasoline have been raising because the easy-to-extract oil is gone forever, and on top of this, consumption got so huge that demand has significantly exceeded the domestic production and the US now imports most of the oil it uses. We pay over a billion dollars of our wealth every day to foreign countries for oil, and in spite of this, most of these countries do not even like Americans. This huge consumption and burning of oil and gasoline have also generated an additional problem: Pollution. These circumstances have pushed governments, car manufacturing companies and consumers in general to take a second look at electric vehicles. Burning fossil fuels, including oil, coal, and gas, is creating massive amounts of CO2 and many other poisonous gasses. These pollutants are in turn saturating the atmosphere with the so called “greenhouse gasses”, culprit of the phenomenon called global warming, which is gradually increasing the temperature of the world, melting the ice caps and causing all kinds of problems, including wildfires, super storms, increased number of tornados and hurricanes, increase of sea levels and extinction of many species among many others. This is where electric cars can help a lot. With electric cars there is no need to import and refine oil. The electricity they use to function is produced domestically. Many critics of electric cars have said that the power plants used to produce the electricity to charge electric cars pollute more than the fuel used directly on cars, but this has been refuted by several serious studies, because the comparison did not include the additional pollution generated by producing the gasoline. To be fair, the pollution created by refining and distributing gasoline has to include Oil extraction, transportation, escorted protection, storage, refining, storage again, transportation to the gasoline stations, storage again and then pumped to the cars; the actual process of refining the oil is a very intensive and energy consuming activity by itself; besides, oil, unlike electricity is a non-renewable resource, and electricity can be produced from nonpolluting sources like for example solar or wind. Another advantage of electric cars is its simplicity. An electric motor has basically only one moving part: The rotor. Comparatively, a gasoline engine is a much more complex machine with hundreds of moving parts that can fail, for example: Pistons, valves, oil, water and gasoline pumps, belts, pulleys, levers, and more. 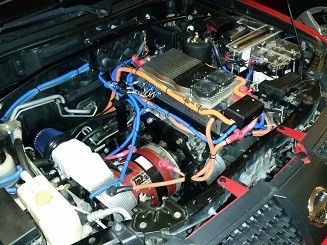 Add seals, spark plugs, filters (oil, air and gasoline) and endless electronic sensors to the mix. The only parts that need to be replaced in electric motors are the bearings, and they last about 50,000 miles of use. An electric motor is estimated to last over 300,000 miles. Besides the motor, electric cars in general are also much simpler and much more reliable since there is no need for belts, radiator, muffler, gasoline tank, catalytic converters, starters or alternators. Electric cars are ideal for city driving, because when they are stopped at red lights or stuck in traffic, their motors do not idle like gasoline cars saving valuable energy. Additional advantages include silent operation, safety (current batteries are safer than gasoline), and that the infrastructure to charge them is already present, because there is electricity available almost anywhere inside urban areas. There is not even the need for additional infrastructure because electric cars charge mostly overnight, when the demand from households and businesses is greatly reduced. At the current rates, its operation cost is between 2 to 3 cents per mile, or roughly about one dollar for every 30 miles of use. This is less than one third of the current price of a gallon of gasoline. The main reasons why electric cars have not been massively adopted yet include the price tag, their reduced range, and the long time they take to recharge, but several things are being done to address these problems. First, because electric cars are still about 50% more expensive than their gasoline counterparts, the US federal government has been offering a tax credit of $7,500 to buyers, and batteries are getting better and cheaper every year as the technology matures. Second, to alleviate the so called “range anxiety”, cars are now equipped with better graphic range estimators, and public charging stations are being added every day. Finally, overnight charging does not seem to be much of a problem, because personal cars are rarely driven all night. Fast charging is also becoming popular and can charge an electric vehicle to 80% capacity in 30 minutes. Demand of oil is expected to exceed production very soon, and pollution is increasing to dangerous levels. A renewable and ecological form of transportation is urgently needed and electric vehicles present a viable solution. Electric cars are simple, affordable, quiet and efficient, and can be charged with electricity produced domestically, and often generated from renewable resources like solar or wind. There is great potential for electric cars to become a main form of transportation in the next decades; their advantages are very evident, and prices are decreasing as this technology is maturing. The range of electric cars is steadily increasing, but even with the current ranges of 80 to 120 miles per charge, it seems to be enough for most of the population (studies show that ninety percent of Americans drive less than 40 miles per day). Early adopters are buying electric cars today mostly for environmental reasons or because they are early adopters, but in the near future, people will buy electric cars because they will save them money in the short term and do not pollute. Florida where I live is a very good place to drive electric cars. The temperature rarely drops below freezing which affects the batteries, it is flat like a tortilla and there is plenty of sun for the use of solar panels to recharge the batteries. The only disadvantage is that everything is spread out and far, so I will have to compensate by adding more batteries and extend my driving range.